Professor Chang Yuhsin from the University of Taipei, the designer of “Huayu 101”, has more than 20 years Mandarin teaching experience. In order to provide easier learning experience, he and his team collect key phrases that people should learn for basic survival. The contents of “Huayu 101” include accommodation, shopping, food ordering, traffic, emergency help, etc. It’s useful for foreign students and travelers those stay in Taiwan, and can be applied to other Mandarin-speaking regions. To attract and motivate young people to learn Mandarin in Taiwan, MOE works with Logan D. Beck, a hotshot youtuber, to produce 2 videos of promoting Mandarin learning and Taiwan’s culture. The first video, “Dajia Mazu Pilgrimage” had reached 50,000 views within a night and it's over 150,000 hits now. 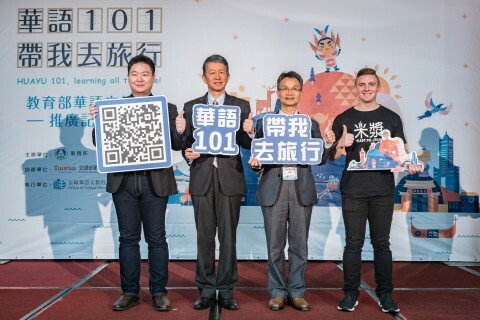 In the press conference, Beck and Mr. Liu, a known rice cake seller, have shown the usage of “Huayu 101” with living drama of night market.